Why Get the 7x Magnifying Lighted Makeup Mirror by Upper West Collection? 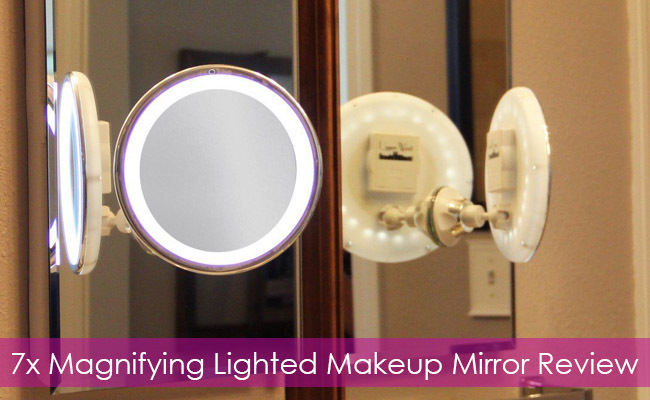 If you’re the type of person that travels a lot and just need the perfect mirror for the perfect grooming or makeup session, a lighted mirror that is easy to travel with and doesn’t disappoint either, is the next thing to get. If you’re also going shopping on a tight budget and don’t want to spend the high dollars for it, your chances of easily finding one look rather slim. 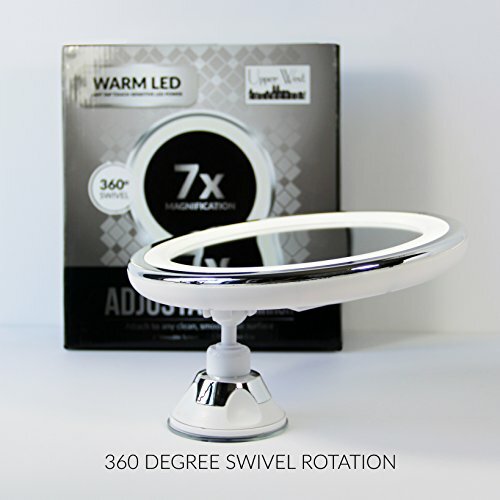 The Magnifying lighted mirror by Upper West Collection is a nice surprise for the buck you’re paying and it’s loaded with many good features. First thing first, the mirror looks nice and makes a good impression at a glance. It comes with a 7x magnification side so you can carefully look into those stray hairs that you’ve always wanted to get rid of. It’s a mirror that folds flat too so you can easily put it in your carrying bag on your next trip. Featuring a good suction cup, the mirror can be mounted or used on your table top, checking the versatility box as well. Still not going for it? Join us on the detailed description to see for yourself why this mirror is so popular out there. The mirror comes with plenty of attractive features and its low price only makes it even more attractive, to begin with. The light of the mirror is warm and bright and the LED light offers you the chance to get a natural look for your makeup every time. The mirror comes with an efficient tap-on LEDs that are long lasting and able to take the intense use. The list of features continues with the flexible arm that rotates 360degree so you can get all the angles you need for getting that special view of the hard-to-reach area when fixing your area or working on your makeup. The 7x magnification is great and if you’re up to it, you get the chance to work on every single tiny detail on skin. It’s helpful for applying your makeup, but also for removing it and tweezing. You can definitely use the magnification for contact lenses application or any other action requiring an accurate close up. The precision of the magnification is good and the glass is clear and distortion-free. Featuring a good suction cup, the mirror is easy to install and has a good stability, once it’s installed. It comes with a lock on mechanism for the suction cup so everything is safe while in use. The suction cup is strong and makes sure the mirror stays in place every single time. It’s easy to attach/detach the mirror wherever you go. Make sure to check the instructions on the locking mechanism so that you always stay on the safe side. Now that we’re on it, we need to mention that the mirror folds down on top of the suction cup, which minimizes its footprint, making storing and travelling with it quite a breeze. The mirror is lightweight too so it doesn’t just take less space in your travel bag, but it doesn’t add weight either. It’s a cordless and wireless mirror that uses AA batteries so you never have to worry about finding a plug for use. Compact and flexible, the mirror is quite the perfect companion for the makeup affectionate. Everything about the mirror is easy. Its suction cup is strong, but it’s not difficult to attach/detach. The arm swivels and runs smooth and easy every time and you can easily obtain that weird angle for the most difficult spot on your skin to work on. The mirror is easy to fold and to take when you’re travelling. The light is good and there are no sophisticated features about it (which may count as a downside, for some). The magnification side is also easy to operate and it’s only patience that you need when using the mirror altogether. And not for the use, but for the detailed work you need to do for your skin and hair or anything else you need. Lightweight, compact, foldable, easy to use and to install, the mirror is a great addition for anyone travelling. Its versatility, magnification feature and ability to rotate 360 degrees add up on the list of good things, helping you decide not if, but when to buy it.